As of late the rap battle between Eminem and Machine Gun Kelly has been heating up. Recently Eminem brought even more attention and controversy to the beef. 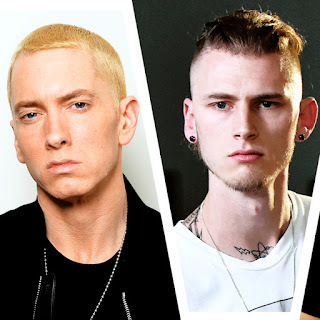 On "Killshot," Eminem speculates of Diddy's involvement and funding the beef on Machine Gun Kelly's side. Em, goes even further and hints that Diddy, ordered the hit on Tupac Shakur years ago. You can't help but see the correlation between this rap battle/beef and the one that horrifically played out years ago. Two great artists lost there lives. Tupac and Biggie we're martyrs of the rap game and the beefs that stem from if. Sadly there were many players in the background pushing and fueling the beef. They walked away with there lives. Now as this rap battle fuels up, your seeing the same players in the background lining up and fueling the beef on both sides. Rap is the only music industry that tolerates such a hateful and destructive thing as battling aka beef. You can blame it on raps competitive nature or it's close ties to the street, either is a piss poor excuse. You don't see rock, country, r&b etc. artists beefing and at times killing or at least bragging about on record. Again only in rap is this tolerated. Hopefully this is a tradition we let go of as rap evolves. With this particular battle we should tune out and realize there both dated artists, one just happens to be younger and less glorified.